I felt better about my lengthy ID challenge after reading what David Wagner wrote about the moth behind the caterpillar in his book, "Caterpillars of Eastern North America." He noted, "It is rare – should you find its caterpillar or secure livestock, take notes and images." Wagner and other sources indicate the caterpillars feed on various members of the Populus genus as well as willows (Salix spp.). 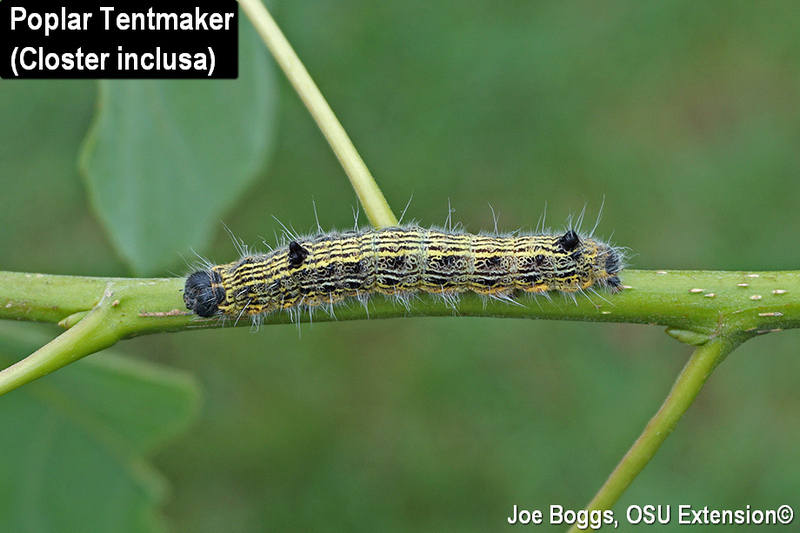 We found the caterpillars feeding on a hybrid poplar (P. deltoidies x P. heterophylla 'Rainbow River'). The caterpillars are "tentmakers" in the truest sense of the word. When I hear "tent-making caterpillars," I think of silk nests like those produced by eastern tent caterpillars (Malacosoma americanum). However, the poplar tentmaker actually constructs tents by using silk to stick together two or more leaves. Then they line their dangling domiciles with a cozy layer of silk. The caterpillars spend the day hanging out inside their protective silk-lined tents no doubt dodging predators and perhaps exchanging grand plans for after they pupate. They venture forth at night to feed on leaves consuming everything except the main veins. If not for the odd dangling "tents," their leaf damage could easily be mistaken for damage caused by a general defoliator such as yellownecked caterpillars (Datana ministra). The look-a-like leaf symptoms also extended to sawfly larvae we found on the same poplars populated by the tentmaker. Thus far, I've not been successful in identifying the sawfly. The larvae looked identical to the species, Nematus calais. However, this species is reported to only feed on willow. Regardless, had the sawfly larvae not been present, it would have been easy to assume all of the leaf damage was being caused by the tentmaker.